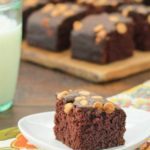 A recipe for chocolate peanut butter snack cake. It is a moist, single-layer chocolate cake topped with peanut butter chips. It is quick and easy to make. Preheat oven to 350 degrees F. Grease and flour an 8- X 8- X 2-inch square baking pan. *Some cocoa powders tend to have lumps. Sift after measuring for best results. Whisk together flour, brown sugar, cocoa, baking soda, and salt in a medium bowl. Add water, oil, vinegar, and vanilla and stir until combined. Pour batter into prepared pan. Sprinkle peanut butter chips on top. Bake for 35 to 40 minutes, or until a toothpick or cake tester inserted in the center comes out clean. Cut into squares or rectangles.